It wasn’t the way patients are cared for that first struck Dr. Wincey Katagira as different, but the patients themselves. Dr. Katagira is a medical learner from the East African nation of Uganda. He recently wrapped up a four-month residency at Niagara Health’s St. Catharines Site as part of the International Outreach Program (IOP), a charitable organization overseen by St. Joseph’s Healthcare System in Hamilton. Run in conjunction with McMaster University, four medical schools in Uganda and the Ugandan government, the program is designed to give Ugandan healthcare professionals experience in a Canadian hospital that can be applied in their home country. The Ugandan partnership was launched 22 years ago under the direction of Dr. Peter Kagoma, Niagara Health’s Head of Academic and Education Centre. 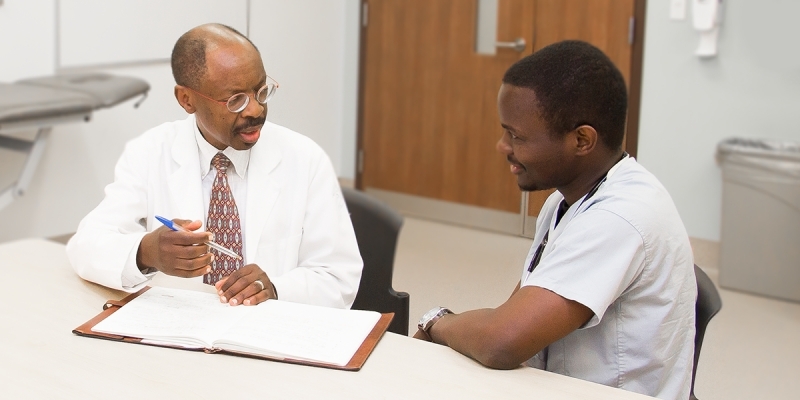 Born in Uganda, Dr. Kagoma completed his medical schooling in the United States and the Caribbean before completing his hematology training at McMaster. Once he was established, he wanted to find a way to give back to his birthplace. Initially, the program brought Ugandan doctors to Hamilton hospitals but over the years has expanded to other Ontario cities, including Brantford and Cambridge. Dr. Katagira, who is a fourth-year resident in internal medicine at Makerere Medical School in Kampala, is the first Ugandan international resident at Niagara Health. Specifically, Dr. Katagira is interested in the care given to sleep apnea patients as there is little equipment in Uganda to help with treatment. With less technology and laboratory resources to work with than their Canadian counterparts, doctors in Uganda rely more on family history and physical exams when making a diagnosis. “Here (in Canada) tests and diagnostic equipment play a larger role in ensuring accurate diagnoses,” says Dr. Katagira. Dr. Kagoma refers to the differences in diagnosing patients as high-touch and high-tech. Each has its own benefits and Dr. Kagoma says both countries can learn from one another. When Dr. Kagoma first began designing the program, he knew it had to be different from other developing nation partnerships, which typically invited visiting doctors to observe medical practices in North America, but not participate. He wanted to ensure that physician learners were able to gain hands-on training that would be directly applicable upon return to Uganda. It was also important for Dr. Kagoma to establish a partnership that was beneficial to everyone involved, including the Canadian institutions. He says by bringing physicians like Dr. Katagira to Niagara Health, local doctors get the experience of interacting with international learners who provide services to patients as part of their training. As well, Niagara Health physicians and staff involved with teaching international learners will potentially have an opportunity to travel to Uganda to visit various medical schools and conduct seminars. In just over two decades, Dr. Kagoma estimates the program has brought over 150 Ugandan doctors to Canada. Many of these individuals are now in leadership positions in their home nation. He says the program is having a big impact on the healthcare system in Uganda.